It is the day before Thanksgiving. Home cooks all over the United States are waking up this morning wondering if they should go ahead and make that new dish they are thinking of, or stick with the tried and true. It’s hard to break tradition on Thanksgiving. Turkey, gravy, stuffing, cranberry sauce, mashed potatoes, apple and pumpkin pie are the essentials. In some areas of the country, green been casserole is a must, although I have never eaten it and don’t know anyone who makes it. Given the number of television commercials for the ingredients, you’d think that it is as ubiquitous on the American Thanksgiving table as the turkey! Other musts for many—sweet potato whatever (casserole with marshmallows? another never tried dish in my world), and something made from corn. I honor the corn tradition because of its historic connection to the pilgrims. Sometimes I serve corn (I heat up a can of corn- yikes, I admitted it!) but most years I make cornbread. I’ll be baking it today. Once I used Mary Steenbergen’s Corn Spoon Pudding recipe from the cookbook Potluck at Midnight Farm. It was tasty, but people didn’t like the corn kernels in it. Once, when we lived in a house with a double oven, I made cornbread in a cast iron skillet and served it right from the skillet. That was cool. There is a recipe for Moroccan carrots that often graces our Thanksgiving table. I am not making it this year, but my sister and her boyfriend are making it, in Florida. I am glad they are. This year I am making plain carrots. I will be using the almonds found in the Moroccan carrots recipe in a new dish, Alton Brown’s green beans with almonds and pomegranate seeds. A colleague saw the recipe in a People magazine he read at the dentist’s office, and shared it with me. This will be a break from tradition this year — one new dish. The pomegranate seeds will be our homage to Jewish tradition, since this year Hannukah and Thanksgiving coincide. “Put plainly, we are going to cook Thanksgiving correctly. And what exactly does that mean? It means there is going to be a turkey, and side dishes and dressing to go with it, and plenty of gravy as well. There is going to be a proper dinner table even if it turns out to be a slab of plywood over some milk crates, covered by a sheet. There are going to be proper place settings for each person and glasses for water and wine. There are going to be candles. There will be dessert. I agree with you, Sam, but I can’t quite bring myself to put NOTHING out. It’s usually an hour or so between the time guests arrive and dinner is served, and our guests travel 45 minutes or more to get to our house. So I put out nuts, carrots and hummus, crackers, sometimes chips. Chocolate covered cranberries in the silver candy dishes. And hot cider with cinnamon sticks of course. Since the publication of Cinnamon Girl, I have been noticing more and more foods and recipes involving cinnamon. I found a goat cheese log covered in apple and cinnamon at Trader Joe’s that we’re going to have. We taste-tested it when we had company last weekend, and found it delicious. For me, the biggest break from tradition this year will be having flowers on the table. 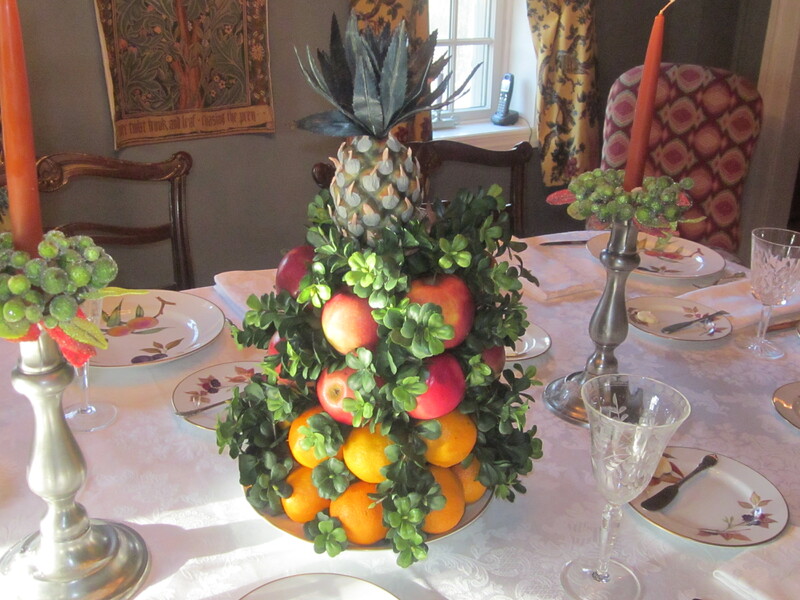 Usually I make a fruit centerpiece based on 18th century American tradition, using a mold I bought at a Williamsburg, Virginia shop. Sometimes I use apples, sometimes oranges, sometimes both. Our house was built in the 1750s, so I do this to honor the colonial history of the house. This year I am a bit under the weather, and have decided to forgo this project to lighten my load a bit. I have the flowers ready to go, and they are lovely. But I’m already regretting the decision. I don’t know how important the centerpiece is to the others, but I know it is important to me. We’ll see how I feel the day after Thanksgiving.